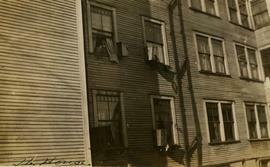 B&W print depicts the side of Mrs. Anne Snider's 9-suite apartment on Keefer Street. "The House" is written on the left corner of the image. 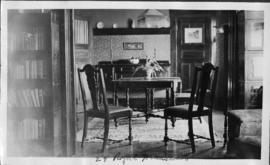 Photograph of the inside of Morris and Rose's apartment at "29 Royal Mansions" in 1921. Photograph depicts the Berkeley Tower of Ocean Towers in Vancouver's West End, near completion.Sixteen storey concrete apartment building surrounded with construction scaffolding in centre of image; cars in parking lot in front of building.